Hammurabi was a First Dynasty king of the city-state of Babylon, and inherited the power from his father, Sin-muballit, in ca. 1728 B.C.. Babylon was one of the many ancient city-states that dotted the Mesopotamian plain and waged war on each other for control of fertile agricultural land. Though many cultures co-existed in Mesopotamia, Babylonian culture gained a degree of prominence among the literate classes throughout the Middle East. The kings who came before Hammurabi had begun to consolidate rule of central Mesopotamia under Babylonian hegemony and, by the time of his reign, had conquered the city-states of Borsippa, Kish, and Sippar. 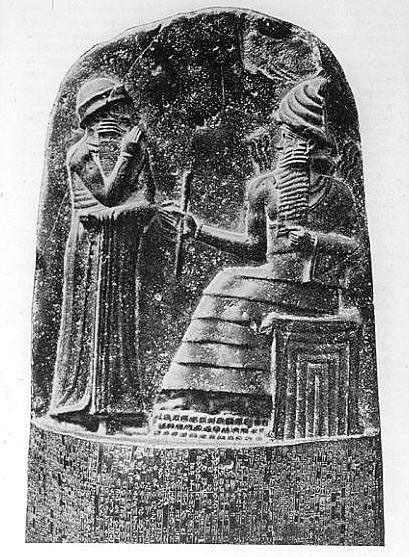 Thus Hammurabi ascended to the throne as the king of a minor kingdom in the midst of a complex geopolitical situation. The powerful kingdom of Eshnunna controlled the upper Tigris River while Larsa controlled the river delta. To the east lay the kingdom of Elam. To the north, the Shamshi-Adad I was undertaking expansionistic wars, although his untimely death would fragment his newly conquered Semitic empire. He became the first king of the Babylonian Empire, extending Babylon's control over Mesopotamia by winning a series of wars against neighboring kingdoms. Although his empire controlled all of Mesopotamia at the time of his death, his successors were unable to maintain his empire.